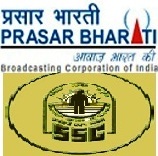 Prasar Bharati is a Public Service Broadcaster of India which came into existence in the year 1997 as an autonomous body. The role of this organisation is to broadcast news, education and entertainment based contents to the public all over the country through the Radio or Television broadcasting. Today Prasar Bharati offers huge number of services which are informative to people, this tends this corporation to expand its operations and to upgrade its service as a most reliable source of information. As a reason of this development, Prasar Bharati needs professionally skilled employees to manage and execute its operations. This necessitates it to recruit employees in huge number. Prasar Bharati along with Staff Selection Commission of India issued a notification regarding the recruitment of Engineering Assistants and Technicians. Applications are invited online by SSC in its official website, interested aspirants who hold eligible qualification can apply by following the instructions advised below. Candidates who holds 3 years Diploma or Degree in any one of the below mentioned disciplines, otherwise Physics as a subject in any Degree is eligible. Along with these qualifications you should possess one year field experience and a desirable knowledge in Wireless Radio Engineering for Engineering Assistant post. For the post of Technician the applicants must possess 10th, +2 pass followed by that they should completed 2 years Diploma in Electronics or Telecommunication Engineering. With eligible qualification individuals up to 30 years of age can apply for the post of Engineering Assistant and candidates between 18 to 25 years of age can apply for Technician vacancy. These age limits will be calculated as on 1s Jan 2013. Moreover, there is relaxation in age which is applicable as per rules for reserved category, Ex-Servicemen and Person with disabilities. Candidates should be eligible in all respects before applying for this vacancy; these applicants will be invited for Written Exam, based on the marks obtained in this exam they will be further invited for personal interview. General and OBC category candidates are advised to pay Rs.200/- only as application fee. This fee should be paid by using the payment Challan obtained while registration or by using the net banking service of State Bank of India only. Other reserved category applicants in any manner don't need to pay exam fee. Candidates are advised to submit online applications in the Staff Selection Commission online registration website. No other form of applications will be accepted by SSC or Prasar Bharati. Log on to the SSC official website "www.ssconline2.gov.in" and select the "Examination" Menu. From the menu select the Part-1 registration and enter the required application details. Check for any corrections and submit the part-1 application by clicking the "I Agree" button. Immediately, you will get a system generated Challan with registration number in the next page. By using this Challan or Registration number pay the exam fee. Then once again log onto the website and follow the same process to choose Part-2 registration. Now you have to upload the scanned photo, signature and payment details in Part-2 and submit it. You will receive a confirmation email in your, keep this email for future reference.